This morning, in one of their trademark Nintendo Direct conferences, Nintendo unleashed a slew of information that has the gaming world salivating. Yes, the Wii U is getting an HD version of Wind Waker, and yes, the Wii U will finally be getting a virtual console service. 1) Eiji Aonuma, the producer of The Legend of Zelda series, revealed two entries in the series for Wii U. 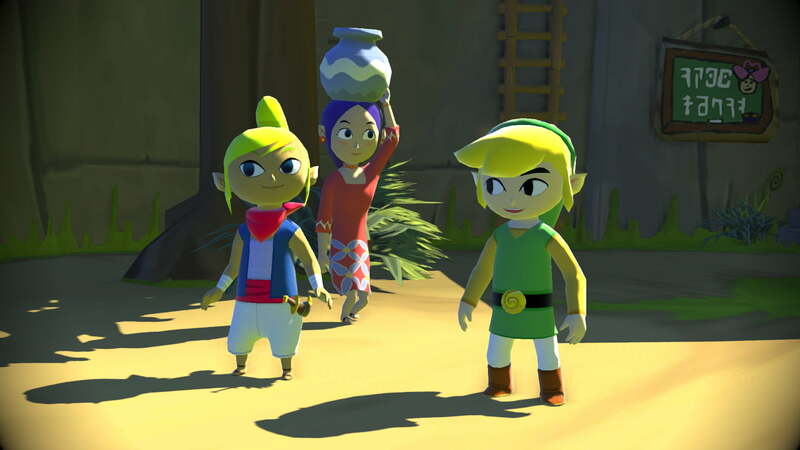 One is the HD remake of Wind Waker, and the other is an entirely new installment. 2) The Nintendo EAD Tokyo Software Development team that made the critically acclaimed Super Mario Galaxy series for Wii, and the Super Mario 3D Land for the 3DS, is working on a new, fully 3D action Mario game for the Wii U. The game is set to be playable at this year’s E3 conference. 3) Nintendo is hard at work on the next installment to the Mario Kart franchise. This new game will too be playable at this year’s E3 conference. 4) A new feature set to be included in Wii Fit U is the ability to create communities for Miiverse from within the game. 5) Upcoming title Pikmin 3 will include a feature that allows gamers to use the GamePad as a camera and take in-game pictures from the Pikmin’s perspective to share in Miiverse. 6) A new installment in the Wii Party franchise is set to be released this summer. 7) Nintendo has a rich history of collaborative games with outside developers. They look to continue that trend with developer Atlus, with a game that includes the Fire Emblem and Shin Megami Tensei franchises. 8) Monolith Soft, the team that worked on the critically acclaimed Xenoblade for the Wii, are working on a new game for the Wii U. 9) The Wonderful 101 and Game & Wario are scheduled to launch in the first half of 2013. 10) The next installment to the popular Smash Bro’s franchise is still on a healthy development schedule. 11) The team that created Kirby’s Epic Yarn for the Wii is hard at work developing the first console game to feature Yoshi as the main character since 1998. Takashi Tezuka, director of Yoshi’s Island and Yoshi’s Story, is over the new game, and it will be done in the same art style as Epic Yarn. 12) A virtual console is finally coming to the Wii U in the spring! The virtual console will include a selection of NES and Super NES games from the start, with Game Boy Advance games to be added in the future. The prices for NES and Super NES games will be identical to that of the Wii’s virtual console. Additionally, gamers who already bought the Wii version of any NES or Super NES games, and transferred the game to their Wii U, can buy the enhanced Wii U version of the game for $1 for NES games and $1.50 for Super NES games. 13) To celebrate the 30th Anniversary of the NES (Famicom in Japan), Nintendo is offering one NES or Super NES game available for purchase each month, now through July, for only 30 cents. 14) In the spring, Miiverse will be made available to browse on smartphones. At first, the experience will be browser-based, but an app is planned for the future. 15) Two new system updates are planned for the Wii U, one each in the spring and summer, which will introduce new functionality and improve system performance. The Nintendo Direct conference also features trailers for the new Nintendo/Atlus game, the new Monolith Soft game, The Wonderful 101 and Bayonetta 2. Check out the conference in its entirety here. Oh man, if the Mario’s anything like Super Mario 64 I’ll be picking up a Wii U just for that! A lot of great content coming, hopefully there’s good feedback at E3. I agree. If they really have that many of those titles playable at E3, and have some mention of the new Zelda, Nintendo is going to have an epic conference.